Ask fellow campers about "Punta Vista RV Park" and nearby attractions. This place is worth the stop for the owner alone. To be clear, there are no bathrooms or showers and the hook-ups are limited (15 Amp power + water), but it's a lovely and safe place to stay. We stayed here for one night in our 21' camper along with another couple in a 26' C class on our way south from Nogales. It's right off the main highway 2 (just past the highway 15 junction) so it's a little noisy but it's tucked away from the road enough that it didn't feel like it. The owner is the sweetest man who is eager to help with directions or recommendations and speaks perfect English. He and his wife used to run the park but she unfortunately passed away a year or two ago. There is a terrace area with patio chairs and decorations to hangout at and watch all of the cats play. If you're taking the 2 or 15 through Sonora, a night at Punta Vista is worth the stop. Feel welcomed into Mexico and enjoy the owner's fantastic stories about the Santa Ana area and being a rockstar in the 60s. We camped at Punta Vista RV Park in a Motorhome. This is a fine place to stop when heading south from Nogales or Sonoyta. The owners, Ana and Edgar, speak excellent English and are eager to help. No rest rooms or showers (Ana says that Edgar is too cheap to fix them when they broke years ago). One pull-through site. The others are large, informal back-ins. A few of them have sewer connections. 15 amp power only. Very low water pressure. Their "free Wi-Fi" is from a motel down the street that hasn't secured their access point, but the signal is very good when they have it turned on. The park is right on Highway 2, .6 miles from the intersection with Highway 15. It is easy to get into and out of the park from the highway. 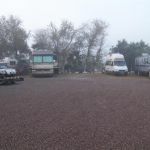 We camped at Punta Vista RV Park in a Motorhome. Are you affiliated with Punta Vista RV Park ?